Let me back up. 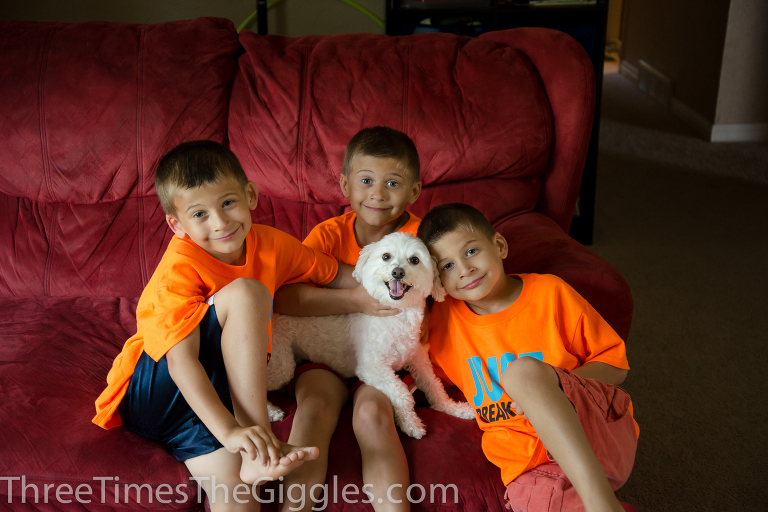 Last month, we played the role of dog sitters for a week! Yep, for a whole week, we opened our home to an adorable little dog! This one was only about an hour into the job (and was posted on Instagram). The dog wasn’t entirely sure what was going on, or why there were so many little kids (she comes from a home with adults and a teenager), but the boys were content to just follow her around the yard (they were all secretly hoping she’d poop and they could fight over who got to get the bag and pick it up. No, seriously!). Sophi (the dog) had a favorite spot in our house – camped out on the back of our couch. She would continue to sit up there at night, while Nick and I were watching TV. 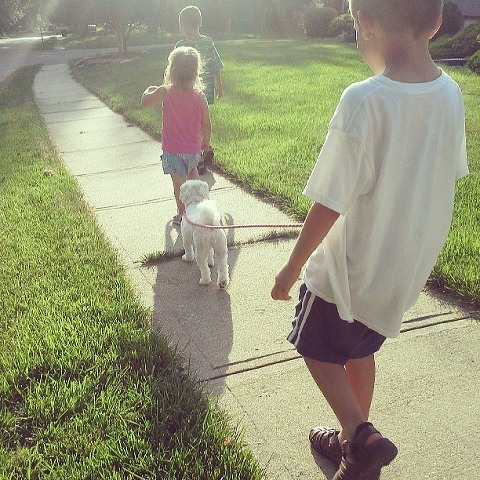 They loved taking her for walks, and were so sad when it was time for her to go back home! Lily struggled when Sophi would start barking at a passing animal or person, but I think she kinda liked that one of her brothers would immediately run to her, hug her, and tell her it was ok.
Ok, so now we’ve got the dog back-story taken care of, so on to the park! 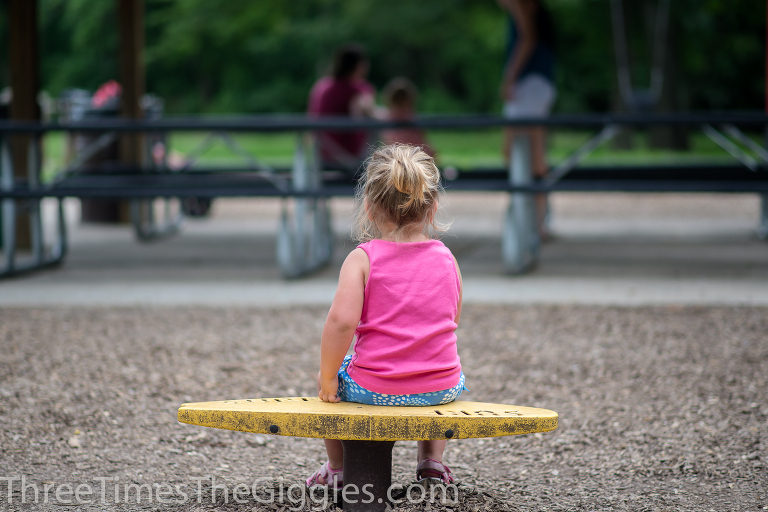 Visiting a new playground was on our Summer Bucket List this year, and this park fit that bill! 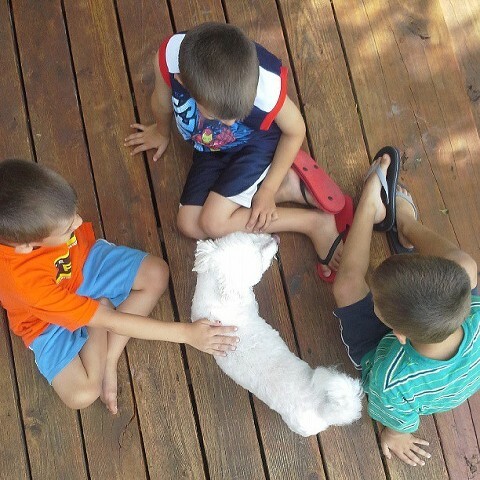 As you’ll soon notice, pretty much only Lily played… the boys just rotated who was in charge of holding the dog leash. After some time at the playground, we walked along the path in search of a GeoCache! My parents are big into geocaching, so whenever they’re here (and they were here, but not pictured this time around) we always try to find some. The boys get a big kick out of the “treasure hunting”! While we weren’t successful at finding this particular cache, the walk was beautiful. Look at this spot! I loved it so much, and I couldn’t decide if I liked it better in color or black and white. The black and white gives a kind of eery look to it, which I find fun, and the color is just peaceful, which I love!